Food. Food. Food. It’s a vital part of culture all around the world. We Palestinians, in particular, simply love our food, and our events always revolve around the beautiful symphony of flavors that make up our cuisine. But food represents so much more than blind consumption. Food is what unites us. It brings us closer to our loved ones through gatherings, and sharing secret recipes that lasted generations. Food is a happy occasion. While it may seem a simple thing, this small act of hijacking foods intrinsic to Palestinian culture, food so dearly beloved by Palestinians, is another step in the direction of Palestinian erasure. We will take note of this attempt at cultural genocide and remain steadfast that we will not permit this to happen. We will protest any attempt at commandeering Palestinian cuisine and labeling it Israeli. We will not be complicit in the erasure of Palestinian culture. Food is the thread that binds generations and builds communities, so right now, we are sending love to all the Palestinian chefs killing the game. Keep doing what you are doing, because representation, no matter the form, will forever matter. Mai, the culinary artist behind Almond and Fig, is a recipe developer and food stylist based out of Chicago. She leaves no room for guessing as to why she takes such a keen interest in cooking; her website proudly states that she cooks “to remember the place [she] came from, (Palestine) and to pass that connection on to [her] children”. Her blog, almondandfig.com, is a treasure trove of traditional recipes, all lovingly collated with the intention of sharing the cuisines that taught her about identity, and the role food plays in fostering a sense of community and furthering traditions. Abeer Najjar is a food blogger at AbeerNajjar.com, and the chef and founder of Huda Supper Club, an underground dining experience in Chicago and D.C. On her blog, Abeer speaks about her determination to start her own underground supper club, a style of event where one can expect restaurant-level food in the intimate setting of a dinner party at someone’s home. Abeer states that each time she hosts an installment of the Huda Supper Club, she has the opportunity to marry flavors from her Palestinian heritage with her experiences as a “first-generation American child of immigrants,” proving, yet again, that food is truly a cultural story-teller. Sarah is the culinary artist behind When Apricots Bloom. On her blog, this charming young woman recounts her desire to cook as proficiently as her mother did, leading her to chronicle her journey on her own website! The wide-ranging variety of recipes on her blog are a sure-fire win for any occasion, so head on over for a real culinary treat! Heifa, the Chicago-based recipe developer behind Fufu in the Kitchen, is on a mission. A mission to develop simple, healthy recipes infused with flavors from all around the world! According to her website, having grown up in a typical Middle Eastern household, her day often centered around food as a source of togetherness and love. As a newly-wed, Heifa brings this passion for food and creating mouthwatering dishes to the forefront, and brings us along for the ride! 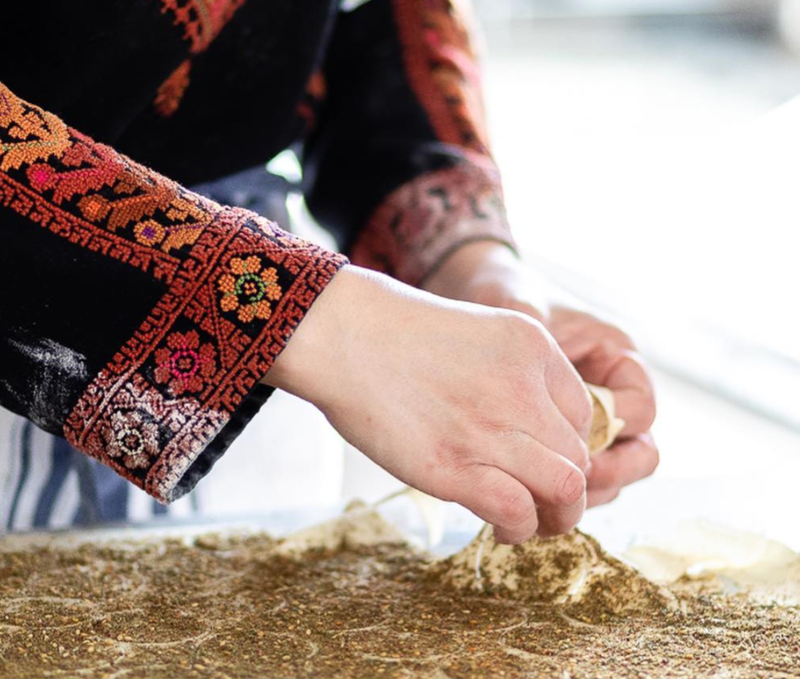 Lulu, the powerhouse behind Lulu’s Gourmet Crackers is a baker and self-proclaimed “cracker manufacturer.” Her Instagram account depicts her love for zaatar, and her eye-catching feed tempts us with images of her delectable artistry. She truly brings Palestinian culture to the kitchen. All in all, it is crystal clear that Lulu’s incredible packaging makes for a fantastic gift for a loved one, or even for yourself. Hey, self-care is a form of love too! Eva Afaghani is the award-winning designer behind Eva Eats. Her colorful Instagram feed shows a stunning variety of Palestinian food, interspersed with cakes that belong in the finest of boutiques! Her website is chockfull of delectable Palestinian recipes that make it a haven for anyone looking to get in touch with traditional Palestinian cuisine! As always, support Palestinian chefs. They are not just making a difference through cultural revival, but are sticking to their roots via the multi-generational art of food, no matter how hard the situation might get. They are continuing culture and traditions that we cannot afford to forget, and for this, they must be elevated and celebrated, always!